1Andaman and Nicobar Centre for Ocean Science and Technology, Earth System Sciences Organizations- National Institute of Ocean Technology (ESSO-NIOT), Ministry of Earth Sciences, Government of India, Port Blair 744 103, Andaman & Nicobar Islands, INDIA. 2 Earth System Sciences Organizations- National Institute of Ocean Technology (ESSO-NIOT), Ministry of Earth Sciences, Government of India, Chennai 600 100, Tamil Nadu, INDIA. Aims: Marine macroalgae are the rich source of biologically active metabolites and potential source for development of novel biotechnological products. The present study was made to explore the metabolically active compounds from the macroalgae of the Andaman & Nicobar Islands. Methods and Material: Different solvents such as methanol (MeOH), ethyl acetate (EtoAc), butanol (BuOH) and aqueous (H2O) extracts of nine macroalgae were tested for antimicrobial, antibiofilm and cytotoxicity (brine shrimp larvae). Results: Out of the 36 extracts 27 extracts showed antimicrobial activity against the human pathogens and 14 extracts revealed antibiofilm activities. The three EtoAc extracts of Sargassum ilicifolium, MeOH extract of Sargassum sp. and MeOH extract of Padina tetrastromatica showed inhibition against 8 pathogenic bacteria. Also, aqueous extract of Padina tetrastromatica (71.82 %) and BuOH extract of Dictyosphaeria cavernosa (71.58 %) exhibited higher antibiofilm nature. The highest cytotoxic effect was exhibited by species Actinotrichia fragilis and all its four extracts significantly (P<0.01) inhibited the brine shrimp larvae, among this aqueous extract showed the lowest LC50 value, 31.7 μg/ml, followed by EtoAc extract, 89.33 μg/ml. Conclusion: It was observed that different species have different kind of bioactive nature. Keywords:Antibiofilm, Antifouling, Antimicrobial, Bioactivity, Cytotoxic Effect, Marine Macro Algae. 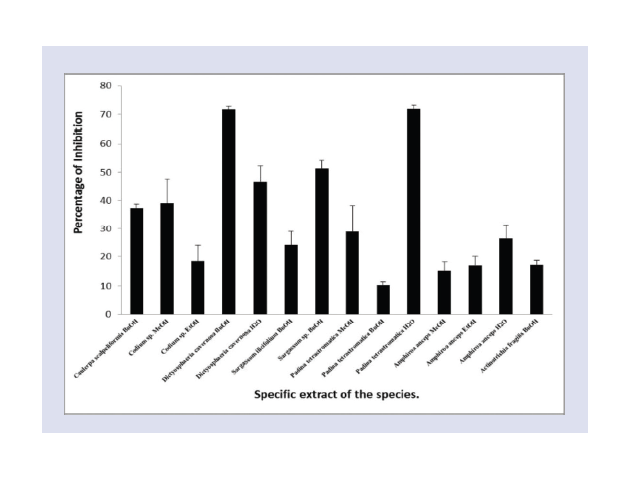 Percentage of antibiofilm activity of active extracts of macroalgae. Deepa S, Venkateshwaran P, Vinithkumar NV, Kirubagaran R. Bioactive Propensity of Macroalgae from the Andaman & Nicobar Islands. Pharmacognosy Journal. 2017;9(6):815-820.